Grate Fireplace Accessories is your one stop shop for finding affordable, top quality and stylish fireside accessories for your fire. We have a huge range of durable products to choose from available in many different designs, styles, sizes and finishes suiting both the modern and traditional home. With such an extensive range of fireplace accessories in stock you can be sure to find what you're looking for. We realise that sometimes there is not always a standard product that will fit your fireplace which is why we offer a made to measure service on many of our fireplace accessories. Our custom size fireside accessories include; made to measure fireplace fenders, fire trims, fire screens, ashpans, stove glass and gas fires, all expertly manufactured in the UK to your exact specification. We have one of the largest ranges of ashpans and fire grates available to buy online with a convenient 'grate finder' and 'ashpan finder' tool to make it quick and easy to select the right grate or ashpan for your fire. 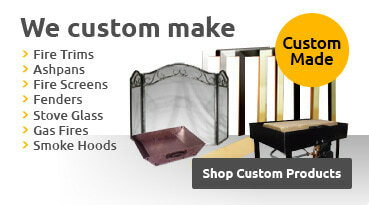 We also have an extensive selection of safety items, such as fire screens and nursery guards available. We guarantee that you’ll have an enjoyable, stress-free and seamless experience when shopping with us. We’re so sure of this that we have teamed up with an independent review service Trust Pilot who collect reviews (good and bad) from our past customers and display them on their website; you can view our reviews here. All of our online payments are processed through third party providers (Sagepay and PayPal) who are 100% secure and store your payment information on our behalf. This means we don’t have access to any of your payment information which is the best way to keep it safe and secure. Our staff are extremely experienced in all things fireplace so if you have any questions, give us a call on 0161 408 1431 or e-mail us at [email protected].